Thanks for the chance. Would love to win!! I love your site and I love Target! And I have for awhile! I’m gonna win this target gift card. Thank you totally target! My kids would love the tattoos!! Would love to win! Thanks for all you do! Already like TT on Facebook! I love Target! I love your site! Awesome card! Thanks for the giveaway! I am a facebook fan and an email subscriber. Love this gift card. How fun! I would love to win this card! thanks for the contest. This is the only way to like bugs! Thanks for the contest. These Wow gift cards are only one of the many reasons I love Totally Target! You come up with the coolest cards! Thanks for all you do Kerry! 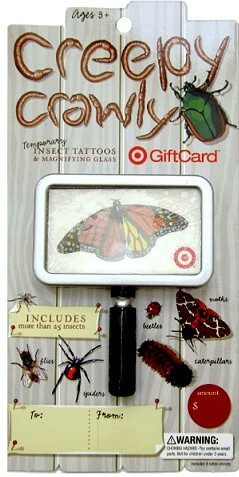 This giveaway sure won’t bug me, even if I’m not fond of insects. I’D LOVE TO WIN! THANKS FOR THE GIVEAWAYS. love your website! pick me! Ha ha ha! Looks fun! crossing fingers!!! PLEASE pick me!! I ALREADY DID AND I LOVE IT!!!!!! I’d really like to win this card. I could really use it! Would love to win this, thanks for the giveaway!